Hello , i will teach you how to perform "combo" skill for (Dark Knight/Blade Knight/Blade Master). Because some of the newbies don't know how to perform it , so here is a helpful guide to do it. Combo is a unique AoE ( area of effect) skill of Blade Knights and Blade Masters can perform. It multiplies your damage depending on your strenght agility and energy for the skill damage! For those who wants to know about combo, i made this guide just for Emerald players. 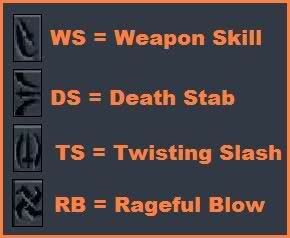 There are many skill types of combinations for combo. But first i'm going to make shortcuts of the skills with image for you to follow easier. Tips : Set your skills in the following hotkey numbers ( 1 , 2 , 3 ) for easier and faster peforming of combo. Thread Closed to Avoid Spam!